Academic conferences are always slightly surreal experiences for me. I’m currently in Monterey, getting to present some of my work to my colleagues in the videogame research community. Many of them I’ve met before, though often these meetings are purely through online interactions. As such, going to a conference in a new location and seeing people face to face who you’ve only known as a virtual avatar can feel almost like stepping inside a videogame. Of course, in 2015, this is hardly a unique phenomenon. It’s not just academic relationships that often begin online, but business relationships, romantic relationships, and relationships simply built around a common interest. As such, it is hopefully unsurprising to say that the actions we take in virtual worlds have material consequences in the real world. Perhaps equally unsurprising is the fact that these new forms of relationships create new systems of power – systems that we often find ourselves ill-equipped to deal with. Last fall, I presented a paper at a conference of the Digital Games Research Association that dealt with some of these issues of power and politics in virtual spaces. This paper built off my previous work on the subject of thanatogaming. As I discussed in a previous post a few years ago, thanatogaming is the application of thanatopolitics in the context of videogames and virtual worlds. It’s a way for us to play with the meaning of death without having to physically die ourselves. As a form of thanatopolitics, it is also a direct response to biopower, specifically the expansion of biopolitics into virtual spaces. As such, in order to understand why we need thanatogaming, we need to understand how videogames are biopolitical. Biopolitics is what Michel Foucault has used to describe the shift in politics away from the traditional forms of governing people as individual bodies and toward governing them as “collective bodies” – demographics, statistics, and man-as-species. Rather than simply governing people, biopower seeks to govern “life”1. Like videogames, biopolitics can be understood as being procedural in nature. Just as videogames must reduce a player’s abilities down to data and statistics like health points and strength levels in order to operationalize them, so too must the biopolitical State in order to govern the masses. Abstract concepts like “public health” that touch millions of different people’s lives in complex and nuanced ways must be quantified and reduced to manageable statistics in order to be controlled and regulated by the State. The development of computer technology – and by extension, videogames – was in part driven by the need for better mechanisms to process and control this data. The modern videogame industry is still very much intertwined with the biopolitical State. Companies wield the power of the State in order to control patents and copyrights, which give technological mechanisms of control like DRM the power to influence and control the way that we interact with the media we consume. As our virtual lives become an ever more important part of our real lives, it becomes critical that we recognize and understand these forms of biopolitical control2. So how do we get people to approach the idea of virtual biopower? It’s difficult to deal with something that is both a very subtle part of our lives and a fairly complex topic. Unfortunately for those of us in academia, the best way to raise public awareness is rarely a seventeen-page conference paper. Complex treatises on biopolitics and Foucault are also not well suited to public service announcements. If we want to reach a broad audience, we need a medium that is both rich in content, while remaining accessible. What we need is a comic book. 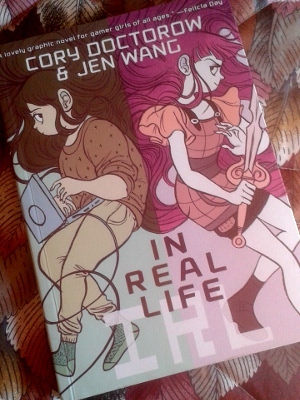 In particular, I’m thinking about Cory Doctorow and Jen Wang’s graphic novel In Real Life, a story about a girl in a small town trying to reconcile her life inside an online game with her life in the physical world. 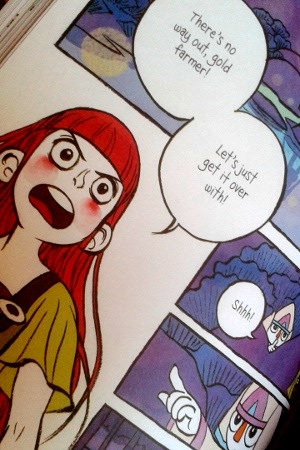 The book follows a teenage girl named Anda as she is introduced to an MMORPG modeled off of games like World of Warcraft and Everquest. The central conflict of the book centers on the practice of Gold Farming – low-wage workers earning in-game currency that can then be sold to wealthy players for real-world money. Anda is hired by a guildmate to help her kill gold farmers, only to end up befriending one of them. 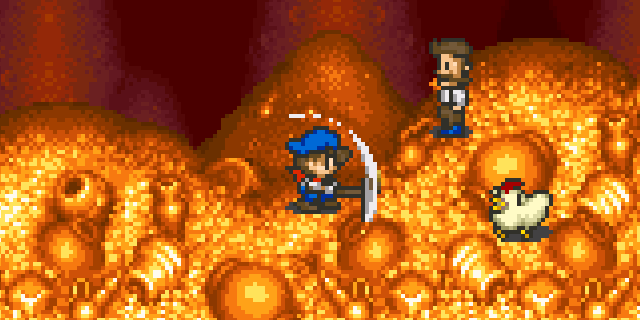 Gold farming is a contentious issue among both players and publishers. Buying gold or other in-game items rather than earning them normally is considered by many players to be cheating, while gold farmers are seen as nuisances for constantly taking easily obtained resources. Companies like Blizzard, who owns and operates World of Warcraft, are likewise motivated to combat gold farming as it can both drive away players who disapprove of the practice, and allow those who use it to play through the game more quickly. As such, gold farmers are both harassed by other players and hunted down by Blizzard and its employees, who have the power to close their accounts. In this sense, the virtual world of Azeroth behaves very much like Foucault’s biopolitical State, albeit with dramatically more panoptic forms of surveillance and control. Ironically, as Nick Dyer-Witheford and Greig de Peuter point out in their book, Games of Empire, the gold farmers that Blizzard tries to keep out of World of Warcraft are often actual Chinese farmers, displaced by their government. As displaced people are recruited to work in gold farms, we see a mass migration from rural areas to cities, and from cities to the online worlds of commercial MMOs. We also see the intersection between the real-world biopower of the Chinese State and the virtual-world biopower of Blizzard, both of which have a very real effect on the lives of the people who live and work within their respective domains3. In Real Life illustrates these complex connections between the physical and virtual worlds by means of the friendship between Anda and Raymond, a young gold farmer from China. The virtual conflicts that Raymond and his coworkers experience parallel the traditional labor disputes encountered by Anda’s father, which also allows the reader to ground concepts of virtual power structures in familiar frameworks. Perhaps one of my favorite aspects of the book as contrasted with most approaches to teaching biopolitics is that it doesn’t shy away from complexity and intersectionality. Anda’s story isn’t just a parable about labor and economics, but a rich narrative dealing with gender, identity, race, and community, and it does all this while still remaining accessible even to teenagers. In Real Life doesn’t set out to be a lesson in biopolitics, though Doctorow does make his message about economics explicit in the introduction. Nevertheless, the book takes complex themes that run throughout my research and puts them into a context that people can relate to. I think I should start making comics a much more common tool in my teaching approach. 1. The Hermeneutics of the Subject: Lectures at the Collège de France. Michel Foucault. 2. Thanatogaming: Death, Videogames and the Biopolitical State. Peter Christiansen. 3. Games of Empire. Nick Dyer-Witheford and Greig de Peuter.